Mokchokpa lived a solitary life devoted to the search for awakening and the extraordinary methods of the path of tantras. In the Brief Life Story of Khyungpo Naljor (khyung po rnal sbyor gyi rnam thar), where his six main disciples are depicted as a tree, Mokchokpa is named the fruit of the clear light and dream yogas. Mokchokpa was born in the valley of Lhapu, up from the valley of Shang, where Khyungpo Naljor had settled his major monastery, Zhangzhong Dorjé Den. Information regarding Mokchokpa’s childhood can hardly be found. He was most likely born in a devout family and he found out and practiced the teachings in his young years. By the age of sixteen or seventeen, he entered Zhangzhong Dorjé Den as a novice. He studied the Vinaya for a year and soon asked for practice instructions . Khyungpo Naljor taught him some, yet he advised him to first study with other masters before coming back and ask for practice instructions. Back to Lhaphu, Mokchokpa met a master named Dromtön  who encouraged him to dedicate himself to Khyungpo Naljor’s instructions rather than seek theoretical explanations. So, Mokchokpa stayed for some time with Yorpo Gyamoché, in Shang. He then went to Dzingkha , south of Lhasa, where Khampa A Seng  was living. By his side, Mokchokpa met many masters from all traditions, such as Zhang Tsöndrü Drakpa  and Chapa Chökyi Sengé , with whom he discussed the specificities of Khyungpo Naljor’s teachings. Altogether with these masters, Mokchokpa was given A Seng’s instructions in the tradition of Luipa, and the Six Unions (sbyor drug). Eventually, he stayed with him for some months or a few years. Travelling together, they alternated every month strict retreats and teachings. During their travels, they met Burgom Nakpo (bla ma bur sgom nag po), one of the main disciples of Rechungpa Dorjé Drakpa , secluded in an hermitage. Mokchokpa stayed there for five years, receiving and practising mostly the instructions of Rechungpa’s lineage , specially the Six Yogas of Nâropa. During those years, he had many contemplative experiences and visions. Then, Mokchokpa dedicated himself to studies for some time, receiving teachings from Latö Könchok Khar. Those precepts were about the progressive approach of the path and meditation. He also received teachings from Geshe Dzarawa, a Kadampa master, as well as from Yorpo Gyamoché, staying close to him for five years. About thirty years old, Mokchokpa returned to Khyungpo Naljor. Despite the good meditative experiences he had gained, he was told by Khyungpo Naljor, who was annoyed that his advice had not been followed, that he had mostly learned to lie, and the teacher shortened their first meeting. Nevertheless, the following day after he had dreamt of Amitâbha, Khyungpo Naljor had him called back and asked him to remain by his side in order to receive the whole of his teachings. Mokchokpa was first reluctant to live with the elders of the monastery. Eventually, he stayed for five years, until Khyungpo Naljor’s death, and was given mostly Niguma’s instructions know as the Five Golden Dharma. Those were passed down to one sole disciple over the first seven generations from Vajradhara to Sangyé Tönpa. After Khyungpo Naljor was gone, Mokchokpa was reluctant to take responsibility at Zhangzhong Dorjé Den and left to go on a retreat in his native valley where he established the hermitage of Lhaphu Mokchok. His main practice was based on the creation and completion phases, dream yoga and clear light yoga in order to purify the attachments and mistakes in the sleep, dream, and waking states. For the two years he was in retreat, he had many spiritual experiences. Yet, as none of them provided him with any certainty, he left to go meet Gampopa Sönam Rinchen. 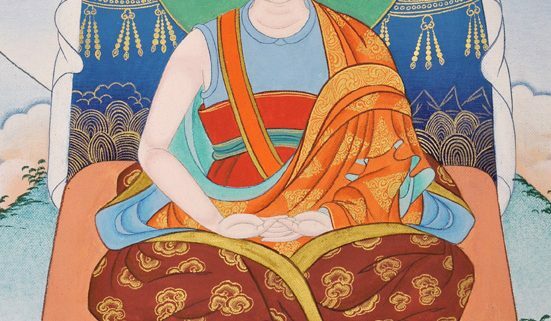 With his help, Mokchokpa perfected his contemplation. In the meantime, Gampopa taught him the entirety of the Dagpo Kagyü’s teachings , starting a lineage of mahâmudrâ called Dashang . Mokchokpa also received precepts from Phamo Drukpa Dorjé Gyalpo and became one of his heirs. He has also been a spiritual friend to the first Karmapa, Düsum Khyenpa . In the space of openess, the source of mind is suspended in clarity. Suspended source, be all relaxed. As many disciples were gathering around Lhapu Mokchok, and after he had dreamt of doing so, Mokchokpa established the monastery of Kuklung nearby. He taught there for many years, to Öntön Kyergangpa among others, alternating periods of retreats at Lhapu Mokchok and teachings at Kuklung. He spent the rest of his life at Kuklung. At the time of his death, he had his nephew, Sherab Repa, to commit himself to the preservation of the continuity of his family lineage, and Lopön Drogön Jotsün to maintain the integrity of his lineage . 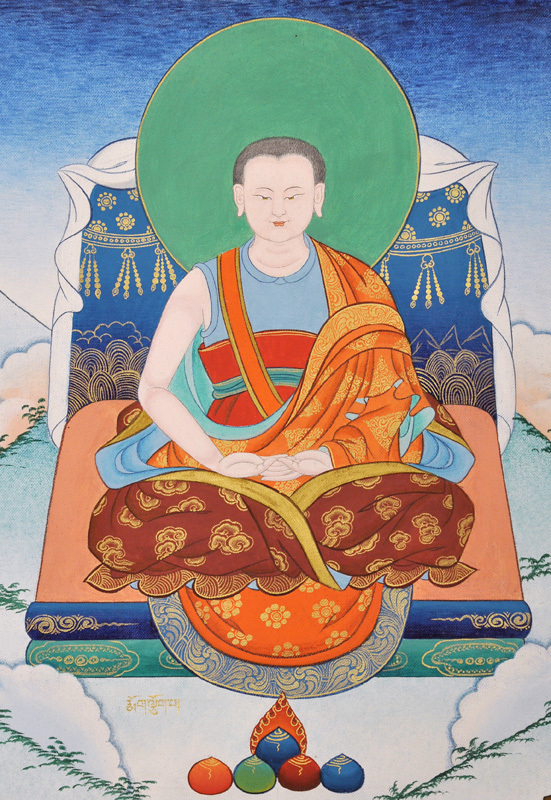 Jamgön Kongtrul’s Nonpartisan History of the Teachings  says that after Mokchokpa and throughout history, the Shangpa tradition spread in all traditions as well as it continued autonomously in Mokchokpa’s tradition. Its main seat was established at Kuklung until the XVIth c. as it moved then to Nyethang Mokchok in the XVIIth c. These being relatively modest monasteries, Mokchokpa’s principle legacy is in the profound method of realization known nowadays as the Five Golden Dharmas. Mokchokpa is the fourth of the Initial Seven Jewels of the Shangpa Kagyü. The most classical progression was to develop comprehension, starting with study, then reflexion and meditation. Not the same person as Dromtönpa Gyelwé Jungné. Khampa A Seng was a disciple of Sachen Kunga Nyingpo. Zhang Yudrakpa, also known as Lama Zhang, founded the school of the Tselpa Kagyü and the monastery of Tsel Gungtang. A major master of the Kadampa monastery of Sangphu. Rechungpa and Gampopa are the two main disciples of Milarepa. They originated the Rechung and Dagpo Kagyü lineages. The first one is a lineage of yogis-hermits when the second one is a lineage embracing the Kadampa monastic dimension. This lineage is cited, among others, by Gorampa Sönam Sengé, in sdom pa gsum gyi rab tu dbye ba’i rnam bshad rgyal ba’i gsung rab kyi dgongs pa gsal ba, as one of the three main transmissions of the Six Yogas of Naropa, which was received afterwards by Sakya Pandita Künga Gyeltsen. Mokchokpa is quoted in Gampopa’s biography as one of his four heart son (thugs sras bzhi). dwags shangs standing for Dag-po and Shang-pa Kagyü. This specific expression is used in the title of one of Mokchokpa’s works, that has probably been lost, cited by Lochen Gyurmé Dechen, in his Catalog of the Shangpa Texts. Founder of the Karma Kagyü lineage and the seat of Tsurphu, wich became a centre of great influence, spreading Niguma’s teachings. According to an enigmatic quatrain of his biography, it is likely that Lopön Drogön Jotsün (slob dpon ‘gro mgon jo btsun) became the master of Kuklung, the monastic site, and Önpo Sherab Repa (dbon po shes rab ras pa), the master of Lhapu Mokchok that would remain a hermitage. It was common to distinguish the family lineage – often called « by nephew » when a master was a monk – from the monastic lineage. Lhapu Mokchok’s lineage, Mokchokpa’s very lineage, lasted. Thus, a master named Lhapu Mokchokpa is numbered among the disciples of the Karmapa III, Rangjung Dorjé. The autonomy of Kuklung’s lineage has been preserved until the XVIth c. due to a number of unappreciated yet important masters, such as Nyamé Sangyé Pelsang. However, there is little certainty to this interpretation as there is no evidence to be found. As for Lopön Jotsün, he could be the older brother and master of Nyamé Sakya Yéshé, the main disciple of Zhang Tsöndrü Drakpa and his successor to the monastery of Tsel Gunthang. Lopön Jotsun and Sakya Yeshé are introduced that way in the Red Annals, both grandsons of a yogi of Shang Lhapu. It could very well be a contemporary homonym related to the same place. Writen by Lama Wangchuk for the Shangpa Foundation, helped by Lama Shérab Drimé’s English translation of bla ma rin po che rmog lcog pa’i rnam par thar pa, shangs chos, vol. 1, p. 145-222. Thanks to Nathalie Brault and Will May.